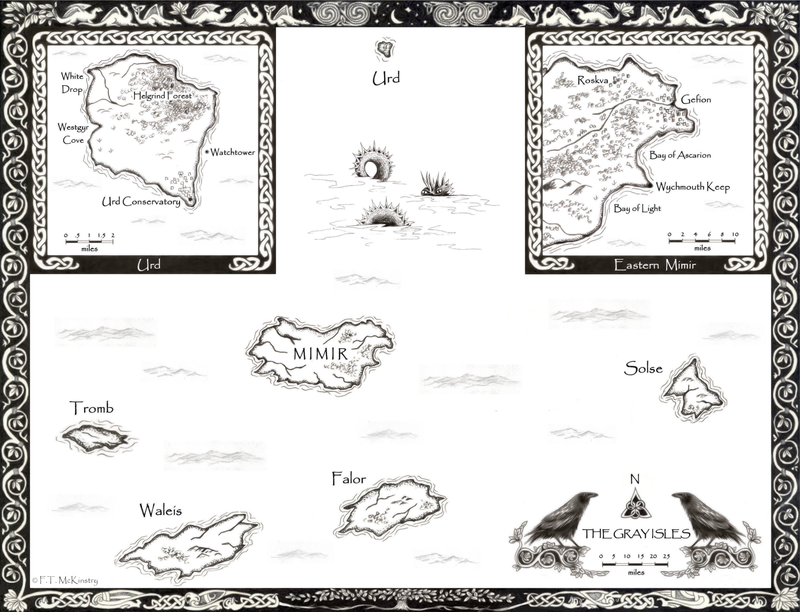 Edros stepped up to the standing stone that marked the boundary of the Fylking’s domain. Smooth and unadorned, the ancient monolith offered no clues as to its purpose. But it had tales to tell. 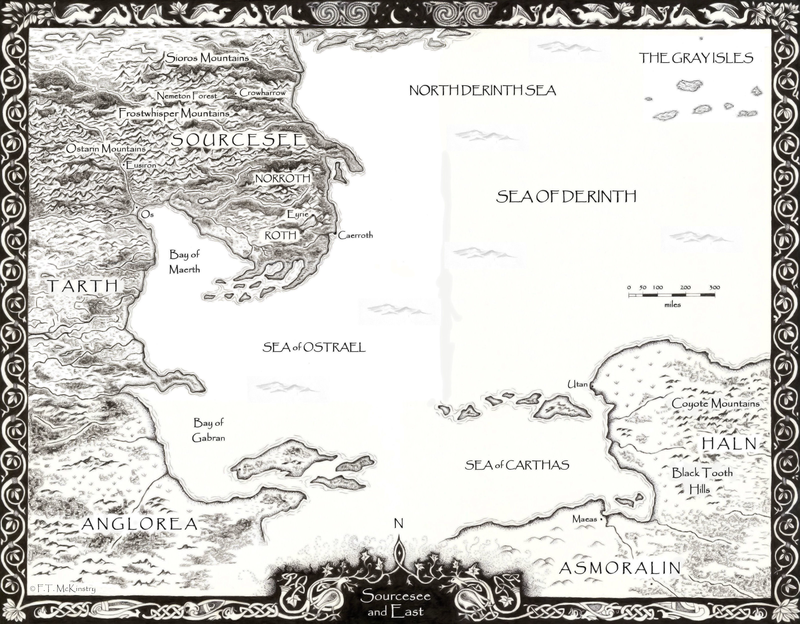 The city of Merhafr, a dense, lively port clustered around the King’s Citadel, spread out behind him like shells cast over the rocky hills plunging into the Njorth Sea. 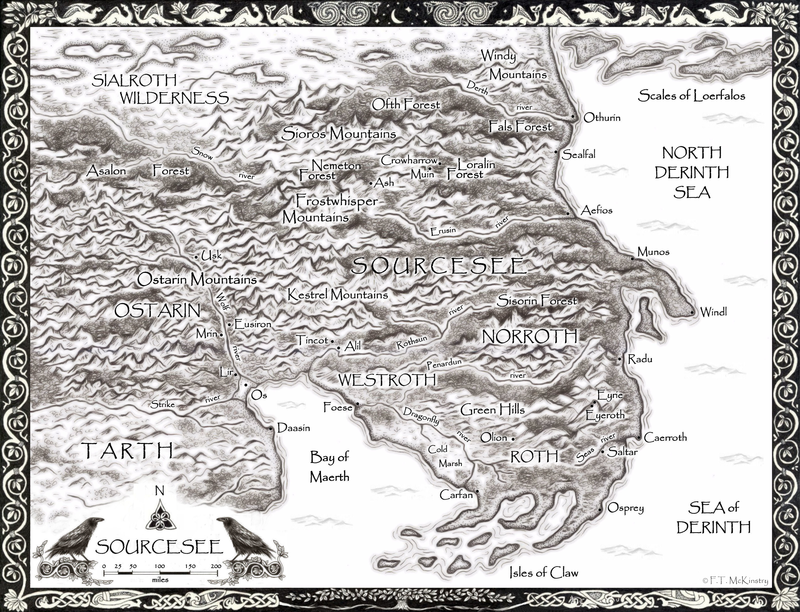 Edros planted his staff with a breath and started up the path toward Tower Sor, perched on the distant crags rising from the plain. The tower’s presence, normally as rough and volatile as the ocean winds, lay cloaked in silence. Gulls wheeled and cried around the height. A shepherd appeared over a rise, driving a small flock of sheep. When he saw Edros with his warden’s cloak and staff, he quickly directed the animals into the brush and stood with his head bowed. The warden murmured a greeting as he passed. The calm that cloaked the sea at dawn had given way to the unruly rifts and white of heavy weather. Wind carried the scent of brine, heather and wild roses. The warden’s Guardian Fylking, who took the shapes of watery places, began to withdraw as they usually did in the presence of the High Fylking, who ruled the towers. Unseen by all but their wardens, the immortal warriors kept their oaths and vigils by the sword. One by one, a whisper in his ear, water lapping on a shore, a cold spot in a lake, fell into quiescence. 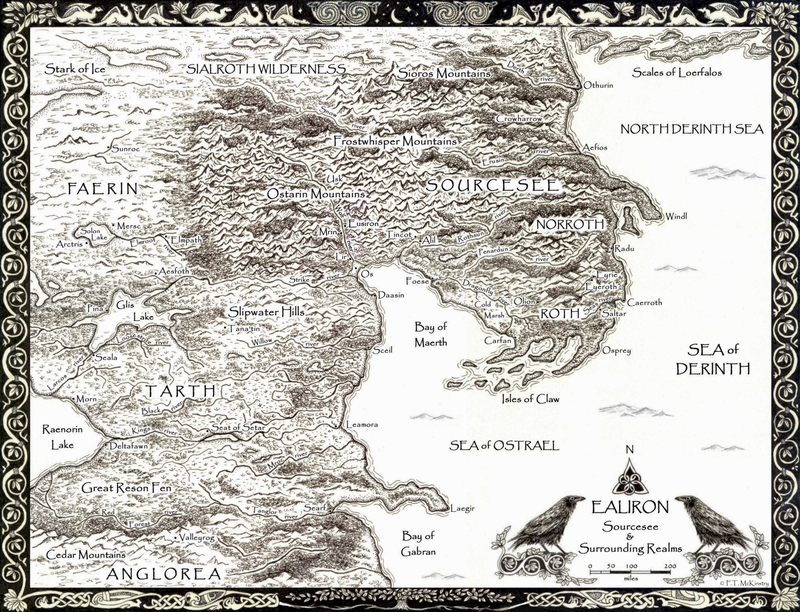 Sor was one of ten towers that defined the realm of Dyrregin. Five inner towers, each 50 leagues apart and 35 leagues from the center of the realm, stood on the intersections of lines between five outer towers. The resulting boundary formed the Gate, a pentacle with a diameter of 213 leagues. In the nine thousand suns since the Gate was built by the original wardens under the direction of the Fylking, the sea engulfed the granite shoals around one of the outer points, Tower Sef, isolating it from land and giving all sailors except wardens something to avoid, as they might a siren’s song. 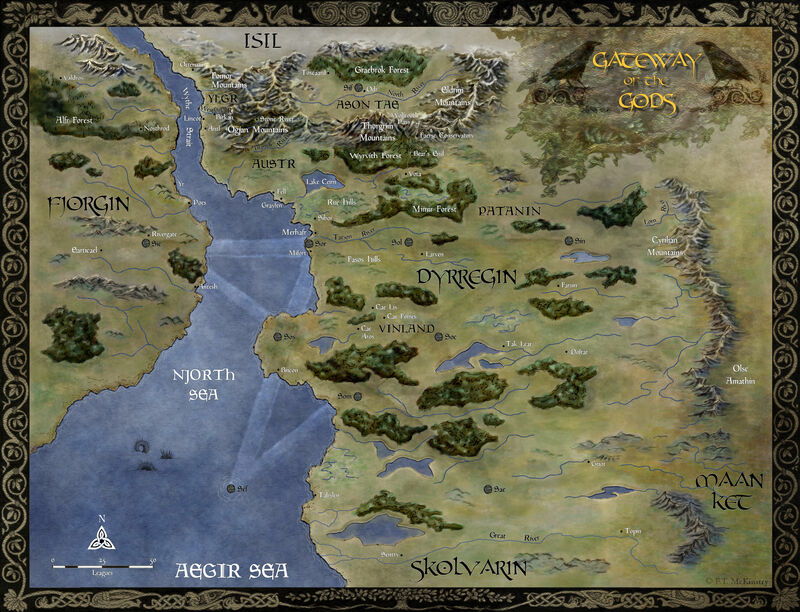 War took Tower Sie, a second outer point which stood in the realm of Fjorgin across the Njorth Sea. Politics, bloodshed and treaties aside, no one interfered with the wardens in their business there unless they wanted to risk being destroyed by their Fylking. 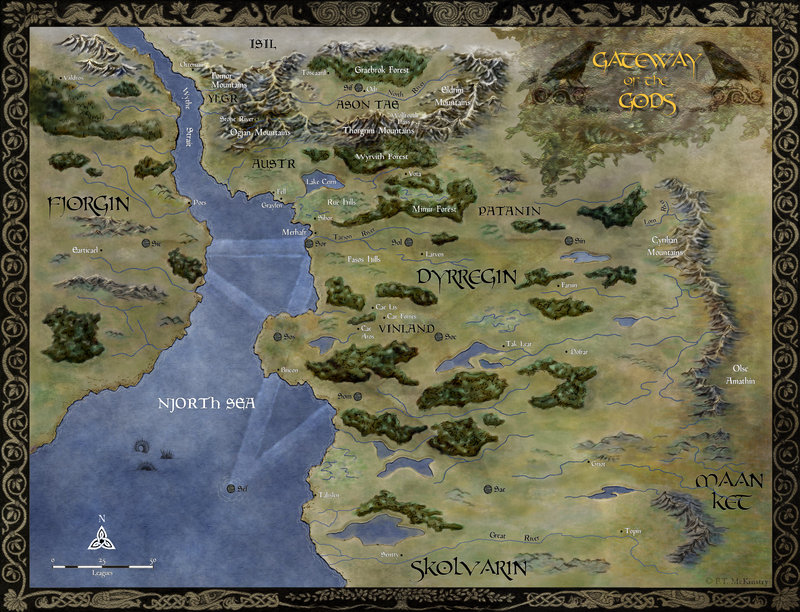 Being relatively new to the Order, Edros had not yet journeyed to Fjorgin. But he had heard the stories. Being deployed on the rugged coast for thousands of suns had given the High Fylking of Tower Sor sullen, moody dispositions. Like the sea, the warriors were rarely silent. Today, however, Edros felt only the storm. He gazed ahead, rallying his inner senses around the tower with unease. The last time he had felt such quiet up here was after he banished the Fylking for frightening a ranger so badly he had lost his footing and fallen to his death on the rocks below. Such things happened around the gatetowers sometimes. Not everyone believed the tales, and fools abounded regardless. But it was the wardens’ charge to protect the citizens as much as they could—or so the high constable of the King’s Rangers had needlessly reminded him. It was said the ranger’s spirit wandered the cliffs beneath the tower, cursing the Fylking. That was nonsense. The Fylking would never stand for such a thing, even if they could cross the boundaries of their dimensions and those of the mortal dead. Silence. Nothing but the sea, crying gulls and wind in the brush. The tower gazed down with a discomfiting stare. On a parapet crowning the top crouched the shapes of dragons—so the Fylking called them—reptilian creatures with scales, long snouts and large bat wings folded against sinuous bodies. 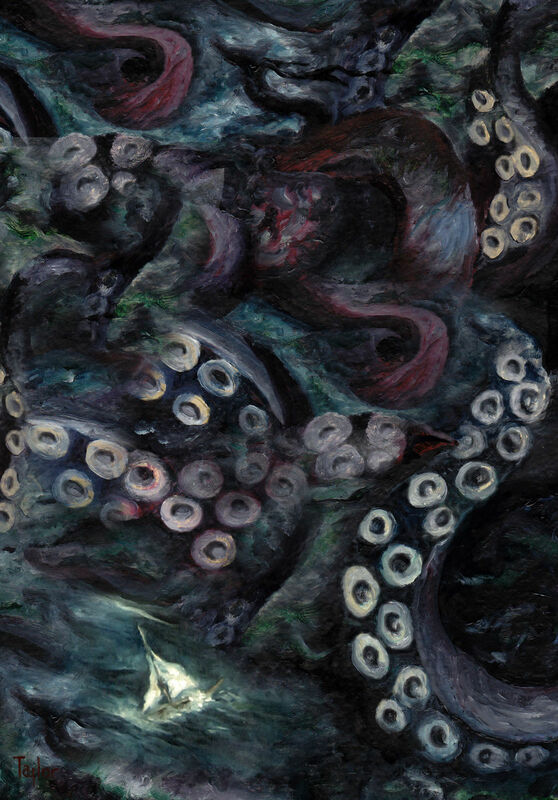 The creatures’ snaky tails twined down into the stones. Their eyes were empty. A subtle prickle touched the warden’s navel as he began his ascent up the winding steps. The ground fell away, the sea grew vast and the wind quickened. Dark clouds streaked the sky like an infection. 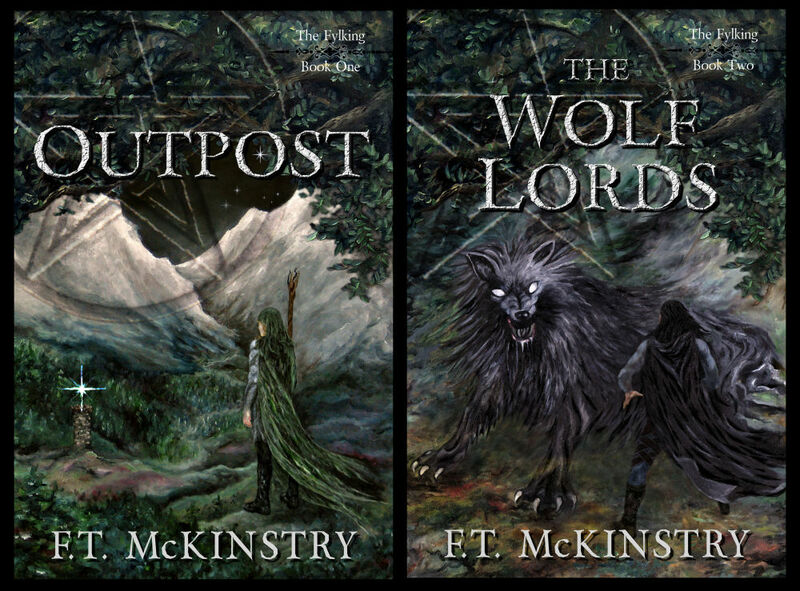 He reached the door, a tall arch of weathered oak with iron hinges shaped like talons. Rain pelted him. As he entered, a screech echoed from the stones, followed by a rush of warm air carrying the scent of wood smoke. His mind went blank as the smell filled his lungs. An impossible smell, in this place. Edros slipped through and closed the door. He had never entered a gatetower to anything but cold and damp—except for that time the High Fylking had greeted him with the smell of roast partridge, a jest aimed at the late King Farcas, who died last winter with a wing bone lodged in his throat. They had never liked him. “Hail!” Edros called out, stepping from the shadow of the thick stone wall. The interior of the gatetower was as large as a warlord’s feasting hall, a cylindrical well rising seventy feet to a ceiling glinting with quartz crystal. Narrow, steep steps spiraled up the walls to a hatch that accessed the top. Thin openings placed here and there in the heights aligned the light of the sun, stars and moon. The Fylking jokingly referred to these as arrow slits, though as far as Edros knew, the inaccessible windows had never been used for that. His heart skipped a beat as he saw the source of the smoke. In the center of the floor, directly on top of the crystal circle that focused the light of the heavens for the Fylking, burned a fire. Heather and broom had been ripped from the roots, tossed into a pile and lit as if by lightning. An old man stood there warming his hands. Where were the High Fylking? They would turn a man to dust for building a fire in here! Chilled to the bone despite the heat, the warden opened his senses to the subtle murk of the rising storm. Wind whistled through the arrow slits, as cold and strange as a nightmare lost to memory. “How did you get in here?” Edros asked in a quieter voice. He and the man were not alone. He sensed the stormy presence of a Fylking filling the tower vaults. Immense and unfriendly, this Fylking had no care for humanity, even hidden by the lofty ascendancy of the unseen. His antipathy was tangible. The warden moved his hand into a Banishing sigil, his fingers curling one after the other into a fist, like a many-legged sea creature withdrawing into a shell. It had no effect. “Don’t trouble yourself with that,” the old man said. “The Sor Fylking are dead and your Guardians scattered to the wind.” He straightened his back and shrugged his tattered cloak to the floor. He was fully armed and clad in shades of brown and green stitched with branches, marking him as a votary of the Blackthorn Guild. Once a noble order of magicians created by King Magnfred, the first ruler to claim Dyrregin’s throne after the Gate War, the Guild had been stripped of its thorns over the centuries and now comprised a harmless assortment of hedge witches and warlocks that served the Old Gods and studied the forces of nature, mapping the heavens, concocting potions for common ailments, talking to crows. Edros had never heard of a Blackthorn warlock wielding arms or associating with the Fylking. Aside from hair the color of ashes, he was not as old as he initially seemed. He had smooth flesh and eyes like winter twilight, pale gray and ice cold. Something about him stirred the warden’s memory. The warlock gazed back, his expression inscrutable but for a sliver of scorn. The wind howled and thunder shook the earth, driving rain and snow into the tower, the spiraling frozen tears of fallen warriors, five of them, beautiful and lying on the floor like felled trees in broken armor made of stars, long hair tangled in blood, and fair eyes staring at nothing. Dead? He had not believed the claim. Edros broke from his trance as the warlock moved. Before the warden understood the way of this, the intruder pulled a knife from his belt and hefted it by the blade. By his side stood the shimmering form of a tall warrior clad in black steel, wearing a helmet in the shape of the spike-crested, fanged creatures on the parapet. It was the warden’s last thought as the knife struck him between the eyes. 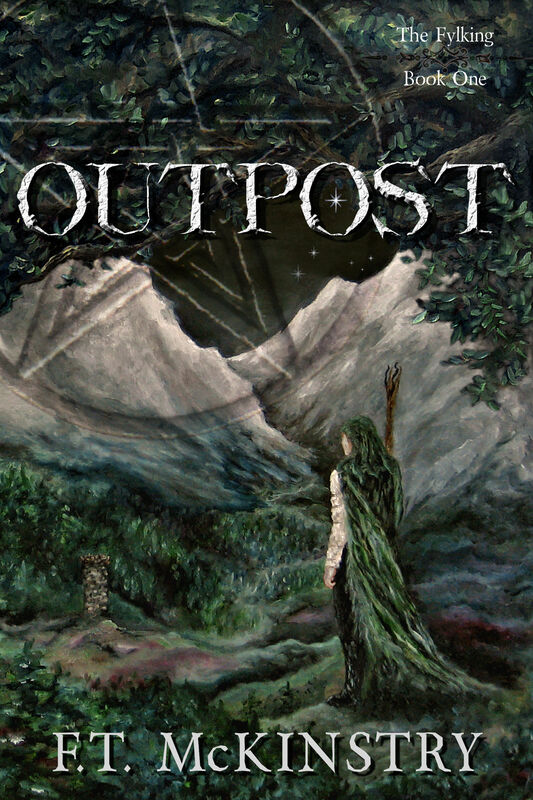 You can read the first several chapters of Outpost here.